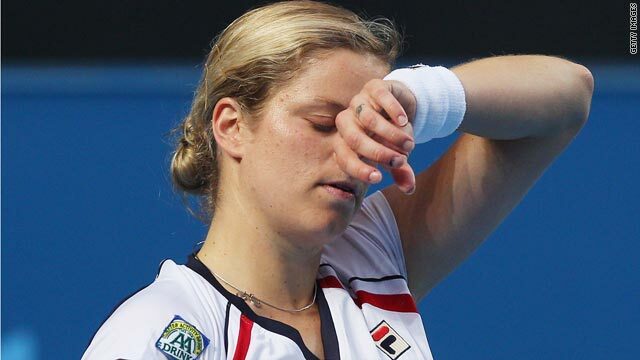 Kim Clijsters suffered her worst result on the WTA Tour as she won only one game against Nadia Petrova. (CNN) -- Kim Clijsters crashed out of the Australian Open on Friday along with eighth seed Jelena Jankovic, but fellow former world No. 1 Justine Henin continued her winning return to tennis. World No. 19 Petrova won the first set in just 18 minutes as 15th seed Clijsters had no answer to her powerful serve and pace around the court. "She was good. But, you know, I let her," Clijsters told the event's official Web site. "I made all the mistakes and she didn't really have to do much. Petrova, who reached the fourth round in Melbourne for the fifth time, next faces third-seeded compatriot Svetlana Kuznetsova for a place in the quarterfinals. Kuznetsova, the 2004 U.S. Open champion, had to come from behind to defeat Germany's world No. 118 Angelique Kerber 3-6 7-5 6-4. Kleybanova, who beat former world No. 4 Jelena Dokic in the first round, led 3-1 in the second set before her 27-year-old opponent rallied to win in two hours and 23 minutes. The 20-year-old U.S. Open semifinalist is ranked 16th in the world but had to come through the qualifying draw following her title in New Zealand as her ban for an anti-doping sanction was suspended too late for her inclusion in the main field. Former world No. 1 Jankovic, who reached the semifinals in Melbourne two years ago, was crushed 6-2 6-3 by Ukrainian 31st seed Alona Bondarenko. World No. 2 Dinara Safina cruised into the fourth round with a 6-1 6-2 win over unseeded Elena Baltacha of Britain, and will next play fellow Russian Maria Kirilenko. Kirilenko, who knocked out Maria Sharapova in the first round, progressed with a 7-5 7-6 (7-4) victory against Italy's Roberta Vinci.